When it comes to fencing, there are a number of materials available and now one of the most popular materials for fences is vinyl. 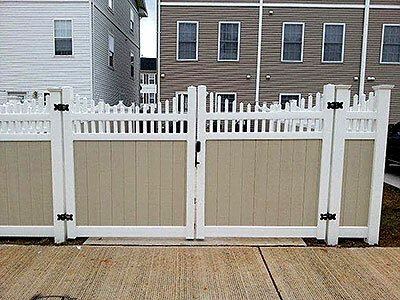 Though wooden fences look elegant, are sturdy and long-lasting, they are high maintenance and have to be stained/painted regularly. Thus many busy homeowners in Annapolis and the surrounding areas like Crofton, South Gate and Odenton prefer to have vinyl fencing installed. Durability - Vinyl is highly-durable and can withstand the elements very well. We use only the highest-quality vinyl in all our projects and the highest grade materials. This fencing will not rust, fade, rot or look old either and it can literally last for decades to come. Once we have installed the fencing for you, there will be no more worrying about how you can make your garden/yard look more attractive. Low Maintenance - This material is very low-maintenance simply because it does not peel, fade, warp, rot or chip. With everyone leading very busy lives nowadays, it is very difficult for people to allocate too much time or energy for maintaining different areas of their home. Thus, they seek low-maintenance options in different installations. Over time, even if you feel that it has gathered a bit of moss or looks lack luster, simply have it washed with soap and water and it will start looking as good as new. Design Choices - Everyone likes to enhance the aesthetics of their home and their landscape. The one way to do this is to add some stylish vinyl fencing to the property. This is available in a range of designs and styles and can add a very unique look to your home. At the end of the day, it is these design choices that make your property look different from the rest of the homes in the neighborhood. Cost-Effective - At the outset, metal and wood fencing might seem like a cheaper alternative. However, when you take the durability and maintenance factors into account, vinyl fencing turns out to be much more cost-effective. When you come to our office at 8057 Veterans Hwy Annapolis, MD 21108, and meet our representative, we will understand what your exact needs are and the budget you have in mind. 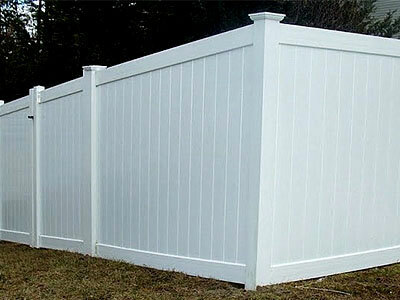 With these factors in view, we will then provide you with the most suitable solutions for vinyl fencing. Call Fence & Deck Connection today.